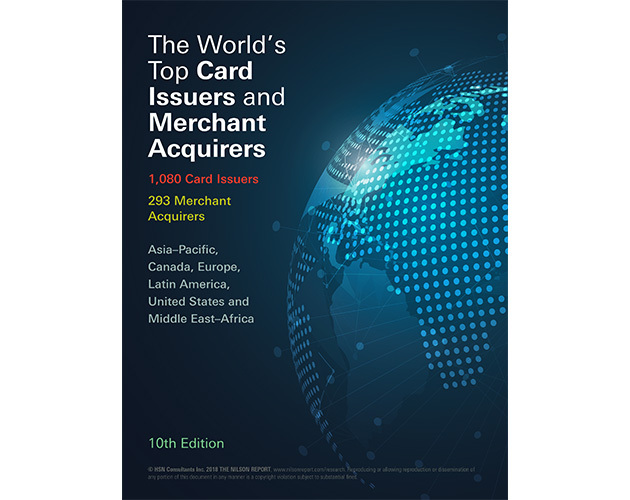 The World’s Top Card Issuers and Merchant Acquirers research publication is now in its tenth edition and includes 120-pages listing over 1,083 financial institutions in more than 115 countries grouped by region – Asia–Pacific, Canada, Europe, Latin America, United States, and Middle East–Africa. 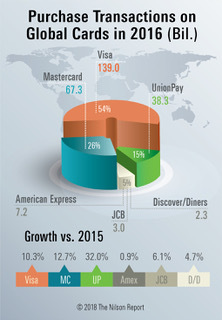 Industry totals are shown by brand by region: Visa, MasterCard, American Express, UnionPay, Diners Club, Discover, JCB. For each region, issuers are ranked by purchase volume, total volume and cards for credit and debit cards combined. They are also ranked by those same categories for credit and debit cards separately. For each region, acquirers are ranked by transactions. Tables show purchase volume, point of sale terminals, and active merchant outlets. They are also ranked by online web transactions as well as volume for all domestic and international brands combined. Already a Nilson Report subscriber? Hundreds of extra listings for Asia–Pacific, Europe, Latin America, Middle East–Africa, and the U.S.
Top 50 Debit & Prepaid Card Issuers in the U.S.
First Natl of Nebraska, U.S.
State Empl. CU (N.C.), U.S.
Bank of the West, U.S.
Webster Bank (incl. HSA), U.S.
San Diego Cty. CU, U.S.
Michigan State Univ. FCU, U.S.
City Natl Bank (Calif.), U.S.
First Federal Svgs. (S.C.), U.S.
First Comm. CU (Mo. ), U.S.
City National (W. Va.), U.S.
Univ. of Wisconsin CU, U.S.
Educat. Empl. CU (Calif.), U.S.
Commun. First CU (Fla.), U.S.
Credit Union of Texas, U.S.
First Natl Bank Alaska, U.S.
North Island Financial CU, U.S.
Univ. of Kentucky FCU, U.S.
Police and Fire FCU, U.S.
Los Angeles Police FCU, U.S.
Univ. of Iowa Comm. CU, U.S.
Svgs. Bank Mendo. Cty., U.S.
Citizens & Northern Bank, U.S.
Central Bank of Kansas City, U.S.
Community First CU (WI), U.S.
IBM SE Employees' FCU, U.S.
Wright Patman Cong. FCU, U.S.
First Financial FCU (Calif.), U.S.
First Amer. Pymt. Sys., U.S.
No. Amer. Pymt. Sol., U.S. Please check your email inbox for the link to a copy of the sample material. You will receive the first 9 pages of the report and an additional data page via email when you submit this form.